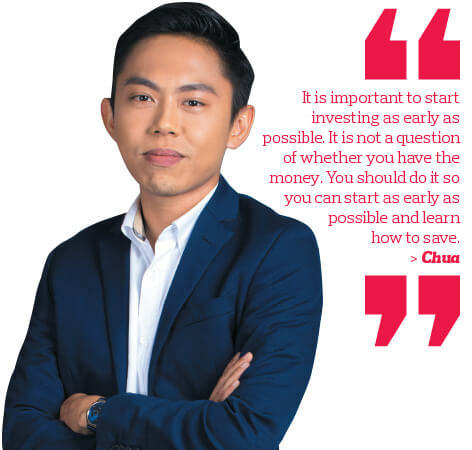 As a child, Ian Chua only believed in saving money but not investing it. This belief was shaped by his parents, who were not big proponents of investments due to their negative experiences. That influenced Chua’s philosophy of life and he grew up with the mantra of saving as much as one can. “My parents used to invest in property, but they suffered losses. From then on, they were not huge believers in investing. Rather, they believed in hard work and that one should work for one’s money,” the 29-year-old CEO of Hermo tells Personal Wealth. However, when he started local online beauty store Hermo in 2012, he began to read more about the benefits of investments. It was at this point that he decided not to let his parents’ practices deter him from investing. “I started learning about investing in 2013. It was because we had to raise funds for Hermo. Back then, I was new to the start-up concept and we needed to understand the capital market. Most of the information I read on investing was online,” says Chua. After all, millennials like himself feel better informed compared with their parents’ generation. Moreover, the information is readily available on the internet, which helps youths better understand the importance of investing, he says. “[What I read online] helped to highlight the importance of investments. We have access to all the information, especially things such as cryptocurrencies,” he adds. So, he began his investment journey by putting his money in low-risk products such as fixed deposits, unit trusts and some stocks. “For unit trusts, I mostly invest in those that focus on technology and China. I familiarise myself with the developments in the tech sector due to my background and work requirements. I invest in China because it is an emerging market,” says the computer science graduate of the University of Adelaide. Last year, Chua began to diversify into riskier investments such as start-ups. This was born out of the struggles he faced when he was trying to establish Hermo. Back then, he and co-founder Poh Soon Chong had difficulty securing investors. “When we started out, Poh and I used up all our savings, which was not much to begin with. It took us about a year before angel investors came on board. Two years later, we received our Series A funding worth US$2 million from venture capital firm Gobi Partners,” says Chua. The difficulty in securing investors led him to invest in start-ups. His investment decisions are based on the people behind the company, rather than what the company does. “Part of the reason I invest in start-ups is to give back to the community. Investing in these companies also means providing knowledge based on my own experiences. I am able to provide these companies with knowledge of the start-up industry based on what I have gone through,” says Chua. To date, he has invested in five local start-ups. They are in industries such as technology, big data solutions and business-to-consumer products. He is aware of the risks of investing in start-ups, but he is not worried about them. “You win some, you lose some. That is life. For me, choosing the founders rather than focusing on their business model is most important. The people who run the companies, their passion and characteristics are the key,” says Chua. His advice to the younger generation is to start investing at an early age. “It is important to start investing as early as possible. It is not a question of whether you have the money. You should do it so you can start as early as possible and learn how to save,” he says. Chua advises millennials to set aside 20% to 30% of their personal income for their savings and investments. This amount can be adjusted depending on how much they earn. “I am a high-risk investor when it comes to my personal investments. So, I set aside 30% to 40% of my income to invest in things such as start-ups,” he says. Chua mentions that several friends of his started investing early as well, particularly in properties and the stock market. He says this has made them more aware of their financial health. On cryptocurrencies, he says this is an area he steers clear of for now as he does not understand it. Ian Chua’s journey as an entrepreneur began in 2011 when his co-founder Poh Soon Chong was inspired by a successful China-based start-up called Jumei. The leading cosmetic store was listed on the Nasdaq in May 2014. Poh found the company’s business model interesting as the platform sought to stand out from the crowd when there was a proliferation of group-buying websites such as Groupon. While these websites focused on services, Jumei focused on products instead. “Jumei sells physical products, for which you can at least ensure good service. However, if you sell services, people may not be able to guarantee the quality of the service, and this is out of the platform’s control,” says Chua. After doing thorough research and obtaining good feedback about the business model, Hermo was formed three months later. At the time, they faced difficulties not because of a lack of interest from buyers, but from brands. “We started out with a few brands. It took us a long time to convince the brands to be sold online. Once we got the first brand on board and helped it to sell really well, we kept pushing hard to prove to the next brand that we could do the same for them,” says Chua. In May last year, Gobi Partners sold its stake in Hermo to Japanese beauty media company Instyle. Chua says the Japanese investors had wanted to expand globally and discovered Hermo while scouting around in the Southeast Asian market. Hermo is currently available in Malaysia and Singapore. There are presently no plans to venture beyond these two countries. “We may delve into other sectors of the business such as beauty media and retail stores. I feel there is still room for growth in Malaysia,” says Chua.